UPDATE: Senate File 74 – Critical infrastructure protection was approved for debate on the House floor Tuesday morning in a meeting of the House Minerals, Business and Economic Development Committee. The vote followed a procedural move to reconsider the bill. Chairman Mike Greear (R-Worland) explained the process and the rules decisions made Monday. (See story below.) 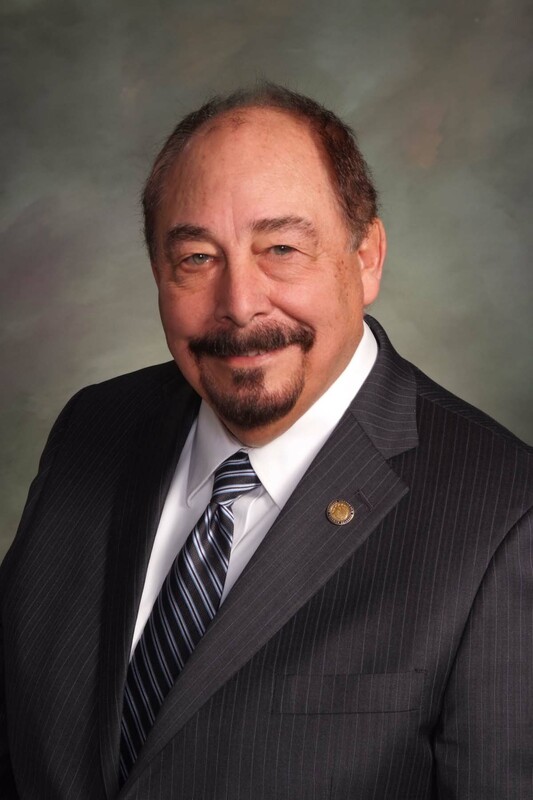 Rep. Bill Henderson (R-Cheyenne) made a motion to reconsider the Monday vote, which had killed the bill. Henderson’s motion passed 6-2. The committee then took a second vote to advance SF-74 to the floor of the House. 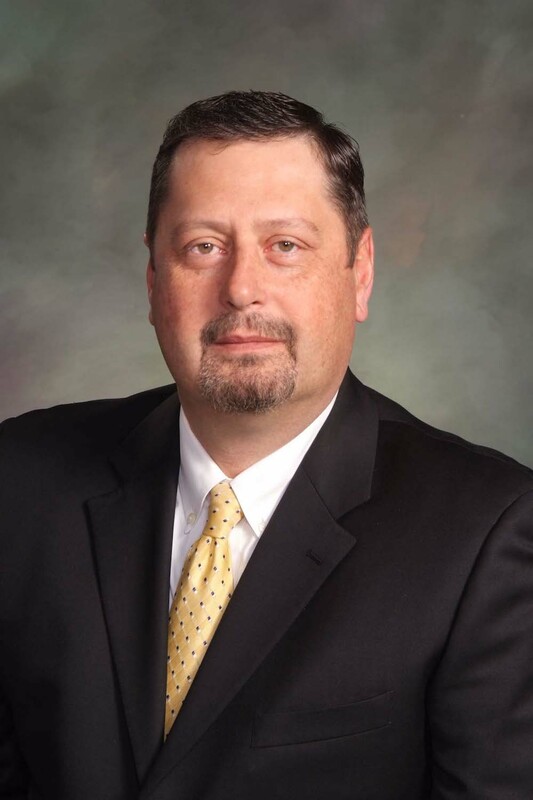 Both Henderson and Rep. Tom Crank (R-Kemmerer) opposed a similar motion Tuesday but changed their votes no to aye Tuesday morning. The bill passed its second vote 6-2. Rep. Chuck Gray (R-Casper) declared a conflict of interest and did not vote. The committee took no public comment and did not debate the bill. The meeting began at 9 a.m. and ended in less than 10 minutes. A controversial bill to limit protests at “critical infrastructure” sites and impose severe penalties on anyone who interferes with those facilities will get a second chance Tuesday morning after failing an initial vote by a House committee, leaders decided late Monday afternoon. The House Rules Committee late Monday afternoon decided to grant a second committee vote on the bill, outraging opponents who thought they had killed it. They charged that legislators were willing to ignore their own rules to bend to the demands of the energy industry. Opponents have said the measure is designed to stifle dissent against the energy industry after the Standing Rock pipeline protests in North Dakota in 2016. “It makes me less likely to want to participate in Wyoming politics when someone fails in the system but is powerful enough to make it so they don’t lose,” Carbon County rancher Joyce Evans said of the House leaders and the energy interests backing the bill. In a House Minerals, Business and Economic Development Committee meeting Monday morning, lawmakers voted 4-4 on whether Senate File 74 Crimes against critical infrastructure should move to the House floor. The tie vote killed the measure because bills must have a majority of the votes cast in committee to pass. One lawmaker recused himself from the vote on a conflict of interest. But after the vote, and after the public meeting closed, one member decided to change his vote from No to Aye. If passed, SF-74 will impose severe penalties on protesters and anyone else who damages or interferes with “critical infrastructure” such as a pipeline or a mine. The measure would impose long prison sentences on anyone who “impedes or inhibits” operation of critical industrial infrastructure and make organizations supporting them vulnerable to million-dollar fines. The meeting was adjourned after the 4-4 vote, meeting attendees say. But the committee chairman, Rep. Mike Greear (R-Worland), never signed the bill jacket, a necessary step for the committee vote to be finalized. After the meeting, Rep. Bill Henderson (R-Cheyenne) asked Greear if he could change his vote, Greear told WyoFile. Greear chose to bring the question of how to proceed with Henderson’s reversal of his public vote to the House Rules Committee, which is composed of House leadership from both parties, he said. The committee decides whether a legislative action conforms with House rules. The House Rules Committee decided Greear’s committee could meet again the next morning and hold another vote on the bill. “I’m not going to stick one of my members with a vote they’re not comfortable with,” Greear said. Opponents of the bill, who thought they had defeated legislation backed by energy and industrial interests only to see their victory overturned largely outside of the public eye, were outraged. “It throws the entire legislative process under the bus and I really feel that committee should be ashamed,” said Sabrina King, policy director for ACLU Wyoming. “They are bending over backward to get this bill onto the floor of the House despite the fact that no one has given any reason other than ‘ecoterrorists are out there’ for why this bill needs to exist at all,” she said. Jill Morrison, a lobbyist with the Powder River Basin Resource Council, agreed. “If industry doesn’t get their way, they’ll change the rules, twist the arm to try and get it through,” she said. Proponents of the bill say it would deter would-be saboteurs from attacking Wyoming’s oil and gas drilling rigs, above-ground pipelines, power plants, dams, electrical substations, irrigation equipment, cable television infrastructure and other facilities. Opponents say it is designed to stifle dissent and scare tribal governments, faith groups, environmental organizations, and others so they will not advocate against energy projects. The bill includes the possibility of a $1 million fine for any organization that supports people who damage “critical infrastructure” or somehow help those who do. SF-74 largely mirrors model legislation posted on the website of the American Legislative Exchange Council. In Wyoming, a long list of energy companies that operate in the state, back the bill, according to its sponsor, Sen. Leland Christensen (R-Alta). The bill was a late entry to the legislative process, and was not publicly considered over the months leading up to the session. It was sponsored by Christensen and 14 other lawmakers, including Senate leaders. But it was brought to the Legislature by Cheyenne law firm Holland & Hart, said Robert Jensen, the firm’s director of government affairs. Jensen is a registered lobbyist for several energy companies including HollyFrontier, owner of the Cheyenne oil refinery, pipeline company ONEOK and Westmoreland Coal, as well as the American Fuel and Petrochemical Manufacturers Association. Those companies and the trade group all support the Legislation, Christensen told WyoFile in February. Jensen said he was as surprised as the legislation’s opponents by the sudden reversal in SF-74’s fortune. He said he had not lobbied Henderson to change his vote, but that he was aware of conversations following the committee meeting. Jensen also disagreed with the opponents concerns that the bill was designed to threaten environmental organizations that advocate against energy industry and other forms of infrastructure development. It arose out of concerns about organizations that might pay protesters or saboteurs, he said. “The main point is to try to send a message that this type of organized effort to damage critical infrastructure will be punished heavily if it can be proven that it’s driven by an organization that’s behind it,” he said. The idea that an environmental organization in Wyoming would pay protesters or saboteurs to interfere with infrastructure is unfounded, the ACLU’s King said. The Rules Committee first met just before 3 p.m. to determine whether to hear the bill again Tuesday morning. 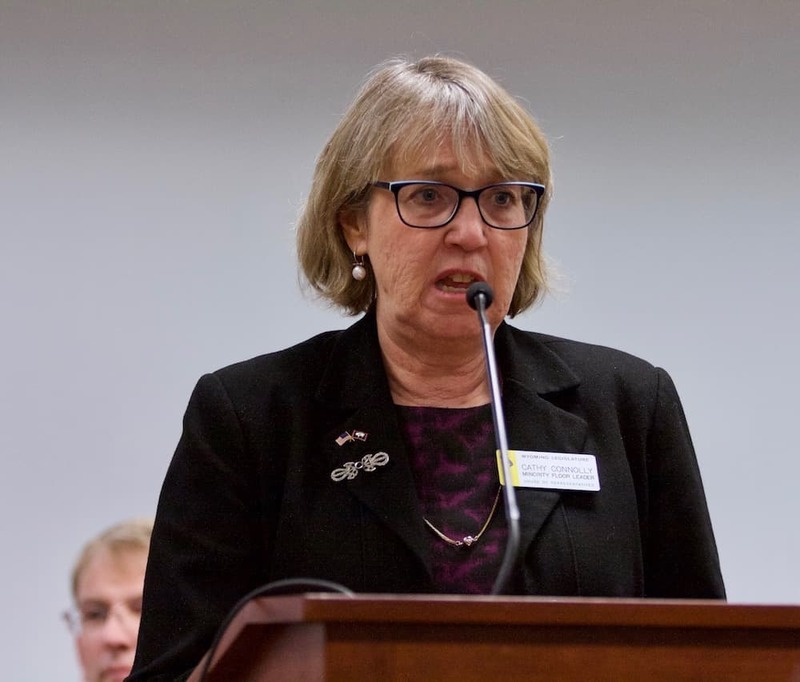 Greear asked if Henderson’s vote could simply be changed, carrying the bill forward to the floor, House Minority Floor Leader Cathy Connolly (D-Laramie) said. Instead the Rules Committee decided the Minerals Committee had to vote again. The House’s rules require that public notice be made by 3 p.m. the day before a meeting. At around 3:20, Connolly was approached by people in the gallery who said they had seen no notice for Tuesday’s meeting of the Minerals Committee, she said. Following those complaints, Connolly requested rules committee review whether the committee meeting could indeed be held, given the late notice. Tuesday is the last day for a bill to be heard by committee, after a scheduling change made by the House earlier Monday extended that deadline by one day, according to the LSO. The notice for Tuesday’s 9 a.m. House Minerals Committee meeting was time stamped at 3:07, Connolly said. The notice was not posted online until 3:58, nearly an hour after the deadline, she said. The House Rules Committee met for the second time in three hours at around 5 p.m. The committee meets in the front of the House chamber. Those meetings are not open to the public. Greear argued the 3 p.m. deadline had been missed because he was in front of the Rules Committee at the time, Connolly said. After that second meeting, Speaker of the House Steve Harshman announced that the bill would get a second vote Tuesday. “The bill is still in possession of [Greear],” Harshman said. He was referring to the fact that Greear had never signed the bill jacket. That procedural fluke made the proposed second vote a continued consideration of the bill, not a new hearing, Harshman said. “There is some question of whether that even has to be noticed,” Harshman said. The decision to allow the vote again stood. Connolly said in ignoring the 3 p.m. deadline the House strayed from its rules. “The rules said three o’clock,” Connolly said. “There were opportunities for that rules committee to happen hours earlier. The letter of the rules wasn’t followed.” Three members of the rules committee voted against the bill, Connolly said, with Rep. Sue Wilson (R-Cheyenne) joining the committee’s two Democrats. “Others voted the rules were followed well enough,” Connolly said. Evans, the Carbon County rancher and a Powder River Basin Resource Council member, traveled to Cheyenne Monday morning to testify against SF-74. The bill “is a direct or indirect attack on First Amendment rights,” she said, referring to the constitutionally-protected right to free speech. “It’s not a bill that is written by Wyomingites for Wyoming,” she said. Then she received word from Morrison, the PRBRC organizer, about the move to hold another vote. “I wish I could say disbelief was my first reaction, but it really wasn’t,” she said. Instead, the news reinforced her “cynicism” about Wyoming politics and the outsized role of the energy industry, she said.